Your payment to our office will be held in a Client Trust Account, or simply known as a “Trust.” Payments are paid by the client (or by someone on the client’s behalf) up- front as an advance on fees and expenses before the work is performed. These funds are held “in trust” and used to pay ongoing work performed by the attorney and/or legal staff or to pay expenses such as: court costs; process server fees, etc. As work is done on the case, said work is “billed” against the Trust. Every month you will receive a detailed invoice that shows the trust’s activity. The work done will be billed against the trust. Think of the Client Trust Account like the gasoline tank that fuels the work on your case. A gas tank must first have gasoline in it before the car can move forward. You can’t drive a car and then pay a bill for the miles you’ve used. Instead, you prepay for the miles you want to use by filling up your gas tank before your trip. If you allow the gas tank to go empty, the car stops moving until you can get more gasoline. When a car runs out of gas, it usually runs out at an inopportune moment. For this reason, most people fill up their gas tanks before they completely run out of gas. You must treat your Client Trust Account in a similar fashion because it too will usually run out at an inopportune moment. As work is done on your case and then billed against your account, your trust balance will go down and eventually will drop below the “minimum trust balance” line. Your bill will explain to you how your money was spent and then tell you what amount you need to pay to get your trust balance back up to the minimum balance. You are welcome to pay more than the amount on your bill if you are able to do so. 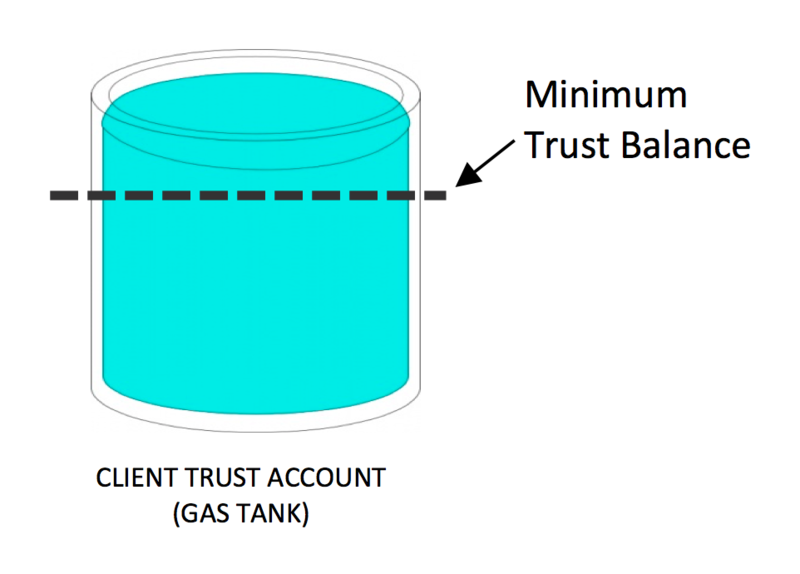 Do not let the “gas tank” of your case drop below the minimum trust balance. This is grounds for your attorney to withdraw from your case. The best way to avoid your attorney withdrawing from your case while your case is active is to plan and budget for a set monthly amount to pay into your trust. It is recommended, but not mandatory, that you pay more than the minimum needed so you are always ahead of the curve. Thus, allowing you to stay above the minimum trust balance on the occasion there is a work-heavy month. Keep in mind that any surplus funds in your trust will be refunded to you upon the completion of our representation. If at any point you no longer wish to be represented by RS Law you may terminate your representation and you will be refunded the money still available in your Trust Account once we have successfully withdrawn from your case. “Available” means the funds that remain after previously completed work has been billed against your trust. Please refer to your engagement letter to determine the hourly rates for your attorney and the attorney’s legal staff.